Childbirth can cause coccyx injuries and chronic pelvic pain. There are many women suffering in silence with these issues. So how does this happen? The coccyx is at the base of the birth canal. When the baby passes through the canal it comes in direct contact with the coccyx. A properly aligned and freely movable coccyx will extend backward and allow the baby to pass through. 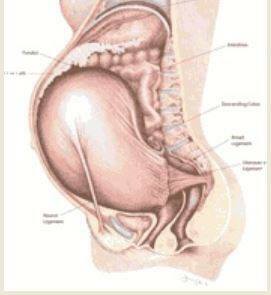 If a woman has a tailbone that is stuck forward into the birth canal, the baby will have to “bust through” to get out. This can dislocated the coccyx, which then leads to pelvic floor muscle spasm and pain. Large babies can cause more damage to the tailbone. Another culprit is the baby being in the occiput posterior position during birth. This is also known as the “Sunny Side Up” position (as seen in the above picture). The baby is born facing up, so the back of their skull pushes on the tailbone as the baby passes through. It is important to fix any tailbone injuries before giving birth to decrease the chances of further injury. We want to be sure that the tailbone has normal motion so that it can extend to open up the birth canal and allow the baby to easily slip by. If you have a past tailbone injury and are unsure if it is affecting your birth canal for future deliveries or if you already have an injury from childbirth, contact Dr. Laura Posl at Midwest Tailbone Treatment Center for a consult and evaluation. Don’t live with this pain, hoping it will eventually go away. Fix the cause of the pain so you can enjoy life and your new baby!